The thousands of daily travelers converging at the crowded Church and Duboce transit and bicycle junction can look forward to a host of streetscape improvements to make it safer and more inviting in the next couple of years. The Duboce Muni portal, converted from a street-level railway decades ago, has remained one of the city’s hairiest junctures for all modes of transportation. 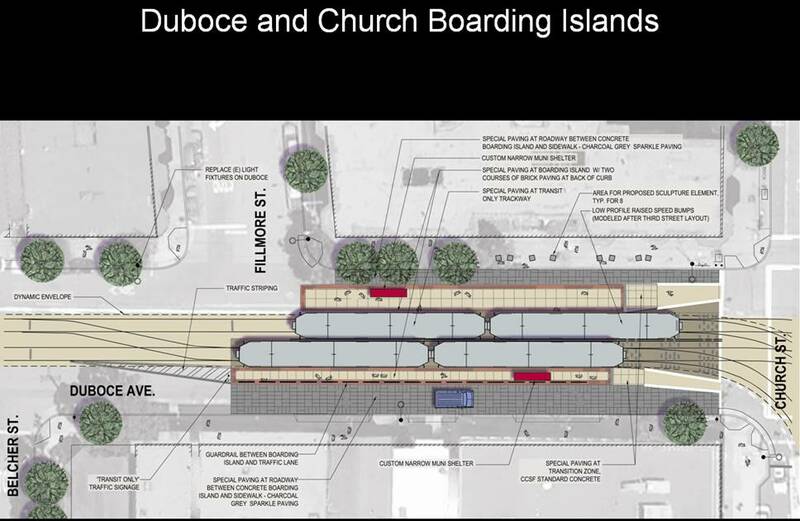 The Church and Duboce Track Improvement Project will bring overdue rail replacement in April, but it’s just the tip of the iceberg for neighborhood-driven streetscape upgrades on the agenda. 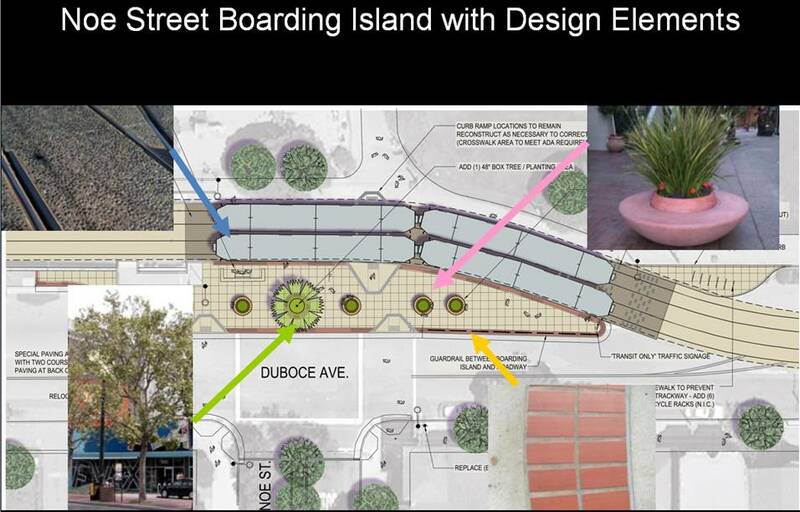 The scope of the initial rail project was expanded to include curb extensions, plantings, lighting upgrades, artistic additions, and a block of green, car-free bikeway after neighborhood groups eagerly collaborated in the planning process with the SFMTA. The project will affect Duboce Avenue from Church to Noe Street and Church Street from Duboce to Market Street. The hub of the project lies where the Duboce Muni tunnel and bikeway meet Church, inersecting two Muni rail lines, a bus line, bicycle and private auto traffic at the gateway to the major Wiggle route. Add to the mix pedestrians accessing one of the busiest street level stops on the Muni’s most popular line, the N-Judah, and you’ve got a mess. DTNA, The Wigg Party, and the Castro Community Benefit District jumped at the chance to add beautification and safety improvements along the Duboce corridor, said Ben Kaufman, chair of The Wigg Party’s Wiggle Transformation Working Group. The project comes bearing gifts for all non-motorized users. 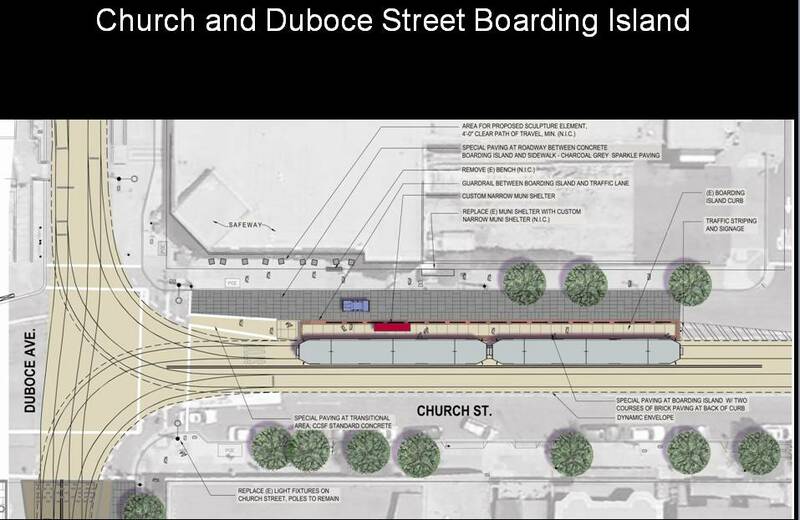 Physical changes will be made to help delineate dedicated transit, pedestrian and bicycle space at the crowded Duboce and Church Muni stop. Access will be prohibited to automobiles on the westbound block of Duboce Avenue from Church to Fillmore, with the travel lane restricted to bikes only. That space will be painted green in order to encourage those accessing the Muni island to cross the bike lane carefully, said SFMTA spokeserson Paul Rose. “A pedestrian-prioritized space is great, but I also think this is a commuter intersection for a lot of people – both bicycles and transit users,” said Kaufman. The Wigg Party pushed to prioritize bicycle movement through the space adjacent to the crowded Muni island, which was a point of contention with the other groups. The change was adopted after the design renderings were created. 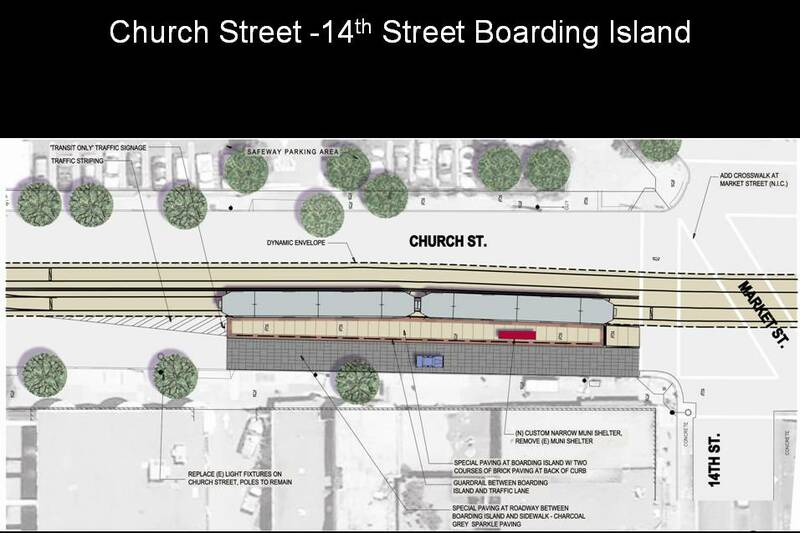 N-Judah and J-Church passengers will enjoy new shelters, wider boarding islands and sidewalks as well as more greenery at the train stops. Many new curbs will be lined with an aesthetic “brick banding” seen on other curbs in the Duboce Triangle, said project architect Nathan Lozier. Transit-only lanes will be resurfaced with a “pebble” material and small speed bumps, and a traffic-calming “charcoal grey sparkle paving” will be used on car-accessible lanes. Guard rails will be added on some boarding islands. Lozier, who lives nearby, offered pro bono landscape consulting on the project as part of Royston Hanamoto Alley & Abey Landscape Architects’ participation in the “One Percent” program. An expansion of the Duboce bikeway mural welcoming bike riders to the Wiggle as well as artistic sculpture seating and upgraded light fixtures will make the corridor more inviting for people walking, biking, and waiting for trains. 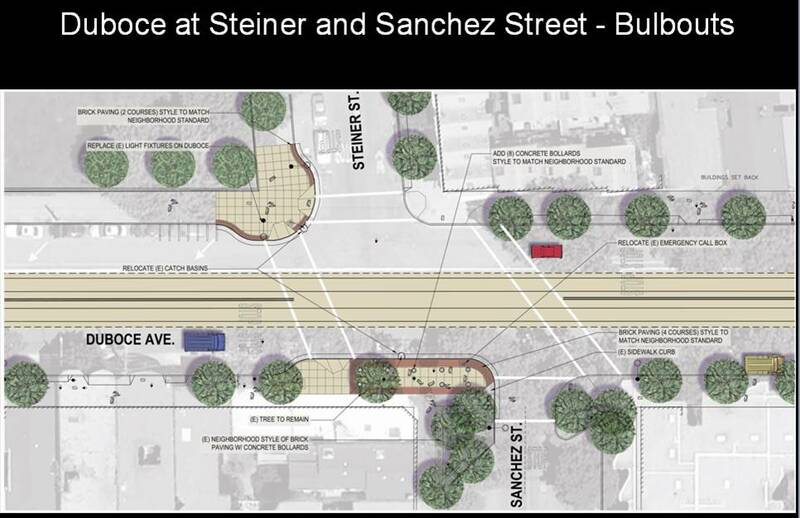 Corner bulb-outs at the large Duboce and Steiner intersection will also increase pedestrian safety. “Particularly on Duboce, we have pedestrian safety issues in terms of people waiting for the N and further down towards the park,” said District 8 Supervisor Scott Wiener. He said he’s thrilled at the opportunity to combine long-needed infrastructure maintenance and streetscape improvements in a cost-effective way. Rail replacement should bring a quieter and smoother ride for passengers through Duboce and Church. However, traffic delays for passing N-Judah and J-Church rail vehicles passing through the intersection is a challenge that needs to be addressed. “I think we should take a look at the traffic controls at that intersection and see if there’s anything we can do to give Muni priority,” he added. SFMTA Board Director Cheryl Brinkman recently asked staff to study best practices to figure out a solution for giving transit a priority at the intersection. “We can’t be the only city with this situation of streetcars going through non-signalized intersections. Somebody out there must’ve solved it,” she said. SFMTA staffers said adding traffic signals would cause unnecessary delays to Muni lines, particularly for the 22-Fillmore running north on Church Street, Kaufman said. One novel idea Brinkman suggested was a flashing light system alerting other road users to yield to oncoming Muni trains, similar to those seen on crosswalks. Yet even if the challenge of crossing a hairball of rail tracks remains for bike riders, Brinkman defended the counterintuitive, beneficial effects on traffic behavior of a naked, non-signalized intersection. Prohibiting car access through the intersection, however, is an “option to consider,” she said. Rail replacement is set to begin in April, and the entire project is expected to be completed by the end of 2012. No one has yet to mention that we have a gigantic grocery store with a gigantic parking lot next to one of our major transit hubs. Bike lanes and pedestrian safety are important, yes, but what about managing the ‘place’ better, not just the street. REMOVE PARKING ALLOWANCES/REQUIREMENTS FOR DEVELOPERS, AND REMOVE LARGE SWATHS OF PARKING FROM TRANSIT CORRIDORS, PERIOD! THERE SHOULD BE NO PARKING WITHIN 500 FEET OF A TRANSIT HUB, EVER! You can’t have bollards across Church at Duboce, because the 22 runs through the Duboce and Church intersection north/south. PLEASE don’t suggest having the 22 do it’s one-block offset movement on Duboce. Do you mean “re-built”? Because the N-Judah has been in the Sunset Tunnel since 1928. If you mean “re-built” then “Yes; those four blocks on Duboce should have been tunnelled as a part of the Muni Metro tunnel”. However, had that happened, the J-Church would probably have been “thrown under the bus”….literally. It’d be a bus line now because it would have had to have its own flying junction to the MMS. Operators change at Duboce and Church because they can ride the J from the base. @google-c07c96c85b7bb45d91f6482849ded811:disqus You have to keep an open mind. You can’t just say because the 22 currently runs down there, then that’s it, we can’t make any more improvements to this intersection and we’re stuck with the current (lowsy) design forever. First, you can make it so 1 or 2 of the bollards automatically retract when the bus gets near. Second, you can reroute the 22 so that, instead of turning down Church, it continues down Hermann to the Laguna/Market/Guerrero intersection where it then goes down Guerrero instead of Church to 16th St. Currently, the 22 and the J both go down this section of Church, and that is unnecessarily redundant, especially since Guerrero has no Muni lines.